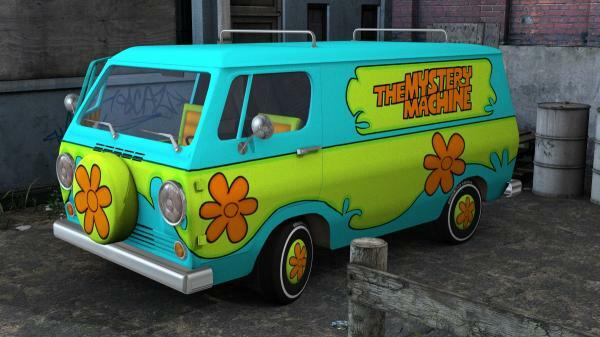 Are you tired of your meddling kids having to walk everywhere to solve mysteries? You need a groovy hippie van, with a Flower Power paintjob! Based loosely on a 1966 Chevy van, this is a fully articulated model for Daz Studio, with all the textures you see here. Simply place all the files in the .zip in the folders as named, and get to solving who has that scary rubber mask this week. I've checked "non commercial use" for obvious reasons. This is for fan art only, but if you wish to retexture the model, you are welcome to use commercially. Just don't redistribute without credit. Drop me a line if you make some fun renders! TigerAnne (8 months ago) Inappropriate? This is so ugly it's beautiful. I love it!!! Thank you sooo much for this amazing car! jonnybode (1 year ago) Inappropriate? JustThisGuy (2 years ago) Inappropriate? dijidave (2 years ago) Inappropriate? TrevorD (2 years ago) Inappropriate? This looks cool. Thanks for the share. Angel_Natavi (2 years ago) Inappropriate? The sheer Nostalgia that emits from this makes this an automatic download. Lexbaird (2 years ago) Inappropriate? I actually did a "cartoonified" morph built off of the Millennium Dog with Great Dane sliders. Basically enlarged the head and paws, and fixed the eyes a bit, and altered the texture. Since it is built on other people's morphs and textures, I can't share, though. I used it in a render in the ShareCG art gallery. I wish Daz would update their dog model, or some place like more …I actually did a "cartoonified" morph built off of the Millennium Dog with Great Dane sliders. Basically enlarged the head and paws, and fixed the eyes a bit, and altered the texture. Since it is built on other people's morphs and textures, I can't share, though. Diogenese19348 (2 years ago) Inappropriate? Groovy! Fantastic! Thank you very much! Wow, what a great van, thanks a lot for sharing.